Identification of a gene needed to expand light harvesting in photosynthesis into the far-red-light spectrum provides clues to the development of oxygen-producing photosynthesis, an evolutionary advance that changed the history of life on Earth. "Knowledge of how photosynthesis evolved could empower scientists to design better ways to use light energy for the benefit of mankind," said Donald A. Bryant, the Ernest C. Pollard Professor of Biotechnology and professor of biochemistry and molecular biology at Penn State University and the leader of the research team that made the discovery. This discovery, which could enable scientists to engineer crop plants that more efficiently harness the energy of the Sun, will be published online by the journal Science on Thursday July 7, 2016. "Photosynthesis usually ranks about third after the origin of life and the invention of DNA in lists of the greatest inventions of evolution," said Bryant. "Photosynthesis was such a powerful invention that it changed the Earth's atmosphere by producing oxygen, allowing diverse and complex life forms—algae, plants, and animals—to evolve." The researchers identified the gene that converts chlorophyll a—the most abundant light-absorbing pigment used by plants and other organisms that harness energy through photosynthesis—into chlorophyll f—a type of chlorophyll that absorbs light in the far-red range of the light spectrum. There are several different types of chlorophyll, each tuned to absorb light in different wavelengths. Most organisms that get their energy from photosynthesis use light in the visible range, wavelengths of about 400 to 700 nanometers. Bryant's lab previously had shown that chlorophyll f allows certain cyanobacteria—bacteria that use photosynthesis and that are sometimes called blue-green algae—to grow efficiently in light just outside of the usual human visual range—far-red light (700 to 800 nanometers). The ability to use light wavelengths other than those absorbed by plants, algae, and other cyanobacteria confers a powerful advantage to those organisms that produce chlorophyll f—they can survive and grow when the visible light they normally use is blocked. "There is nearly as much energy in the far-red and near-infrared light that reaches the Earth from the Sun as there is in visible light," said Bryant. "Therefore, the ability to extend light harvesting in plants into this range would allow the plants to more efficiently use the energy from the Sun and could increase plant productivity." The gene the researchers identified encodes an enzyme that is distantly related to one of the main components of the protein machinery used in oxygen-producing photosynthesis. 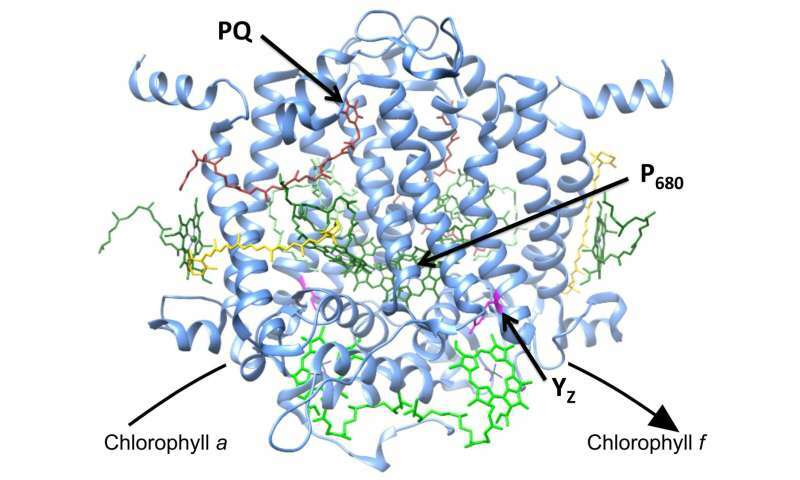 The researchers showed that the conversion of chlorophyll a to chlorophyll f requires only this one enzyme in a simple system that could represent an early intermediate stage in the evolution of photosynthesis. Understanding the mechanism by which the enzyme functions could provide clues that enable scientists to design better ways to use light energy. "There is intense interest in creating artificial photosynthesis as an alternative energy source," said Bryant. "Understanding the evolutionary trajectory that nature used to create oxygen production in photosynthesis is one component that will help scientists design an efficient and effective system. The difficulty is that photosynthesis is an incredibly complex process with hundreds of components and, until now, there were few known intermediate stages in its evolution. The simple system that we describe in this paper provides a model that can be further manipulated experimentally for studying those early stages in the evolution of photosynthesis." By disabling the gene that encodes the enzyme in two cyanobacteria that normally produce chlorophyll f, the researchers demonstrated that the enzyme is required for the production of chlorophyll f. The experiment showed that, without this enzyme, these cyanobacteria could no longer synthesize chlorophyll f. By artificially adding the gene that encodes the enzyme, the researchers also showed that this one enzyme is all that is necessary to convert cyanobacteria that normally do not produce chlorophyll f into ones that can produce it. Another clue that the newly identified enzyme could represent an early stage in the evolution of photosynthesis is that the enzyme requires light to catalyze its reaction and may not require oxygen, as scientists had previously suspected. 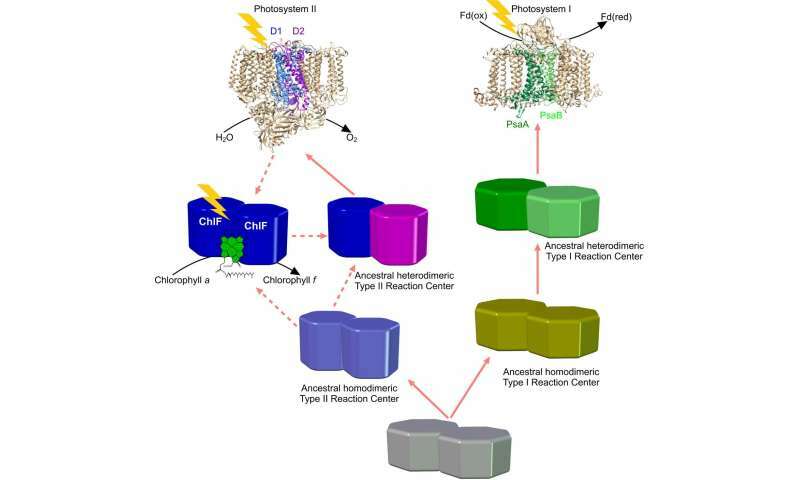 "Because the enzyme that synthesizes chlorophyll f requires light but may not require oxygen for its activity, it is possible that it evolved before Photosystem II, the photosynthetic complex that produces oxygen and to which the enzyme is related. If the enzyme is an evolutionary predecessor of Photosystem II, then evolution borrowed an enzyme that was originally used for chlorophyll synthesis and used it to evolve an enzyme that could produce oxygen, which ultimately led to changes in Earth's atmosphere," said Bryant.